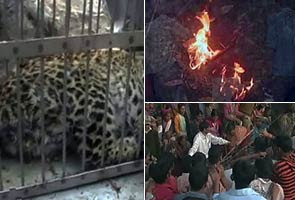 In a barbaric act, an angry mob burnt a leopard alive after threatening to kill forest department officials who tried to stop them in a forested area near Kotdwar in Uttarakhand’s Pauri district in India a few days ago. The mob of around 400 angry residents threatened them with stones and sharp-edged weapons as the officials were trying to tranquilize the seven year old leopard. The residents were angry as the leopard had mauled three people from the village the previous week. They doused the leopard with kerosene and burnt it alive, and all the forest department officials were forced to be silent witnesses to the ghastly act. Man’s cruelty and selfishness knows no bounds. First he grabs all the forested land and when he has a clash of interests with animals, he kills them. Innocent animals are being killed all over the world for no fault of theirs. Human beings have built an empire of greed over the dead bodies, blood, bones and skins of their lower cousins, the helpless animals. This barbaric and unjust treatment of innocent animals must stop immediately. The authorities concerned and the people of this planet must ensure the safety of animals as they have been here before we came into existence. We all must remember that if there would be no animals on the earth, there will be no earth for us to live on.